Over the months of September to December I worked at the Northern Conference Opal Series Tournament in Sheffield providing pitch-side medical cover. At each event I provided pre-event treatment and pitch-side first aid during games should it be required. The final tournament in Sheffield was incredibly busy. While I covered the top field, another therapist Steph covered the bottom field. Although it was very cold on the pitch I didn’t feel it all too much thanks to the 6+ layers I wore, being so busy and for the cups of tea I was very kindly supplied by the East Kildride Pirate ladies. Working at these tournaments was a great opportunity to learn about the game as I had previously only worked with contact football. Although I’m a huge lover of tackle football I thoroughly enjoyed watching and working with the flag teams. The two games are very different so there’s a lot for me to learn! Despite the game being ‘non-contact’ it was interesting to learn the beliefs of some who attended the day that injuries (particularly concussions) do not occur within flag football. This certainly wasn’t demonstrated during the tournament. I saw a good number of concussions. At the final especially I was very busy with management of injuries. 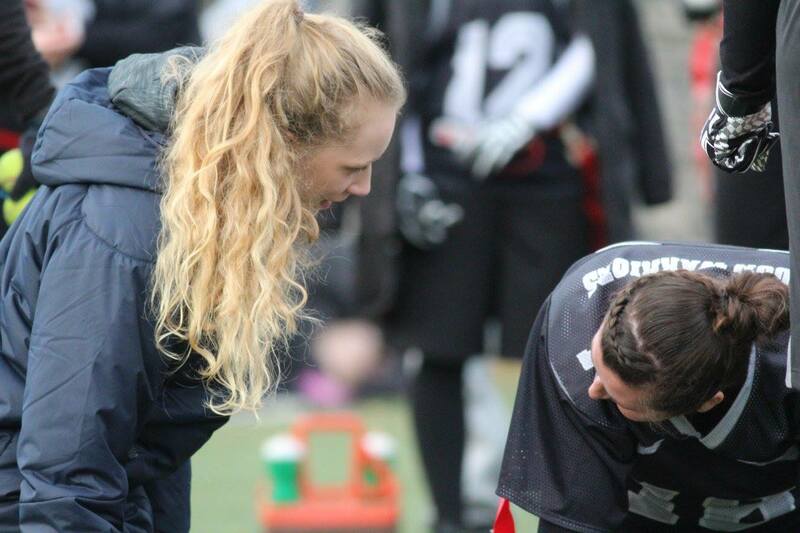 It was made clear that player education around injury care is greatly needed within flag football. Thankfully on the day and as a follow up I was able to advise, however this education needs to reach the wider community – something I aim to do through Gridiron Strong and my research! Hopefully I will cover the Opal Series in autumn 2018 to see how the teams have developed over the year! If you’re a coach or player and want to top up your injury care knowledge then check out the Gridiron Strong downloadable e-book here. If you’re interested in Women’s Football find more info here. Thanks to SamCrowPhotography for the photo!